Camdyn is the Hawkeye Kid Captain! Our very own 5th grade student, Camdyn, was selected to be the honorary Kid Captain at the University of Iowa football game on Saturday, September 30. Kid Captain is a partnership between University of Iowa Stead Family Children’s Hospital and the Iowa Hawkeyes. The kid captain program honors 13 pediatric patients each year by highlighting their inspirational stories. Camdyn is true inspiration to everyone she meets! 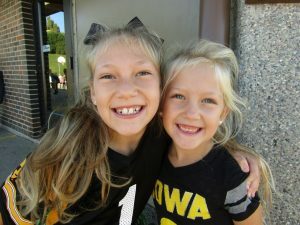 See how the students and staff at Eisenhower supported Cam by wearing their black and gold on Friday! Learn more about Kid Captain Camdyn here!